Listed in: Appliances, Dinnerware, Gifts and Housewares categories. Get more for your wedding! 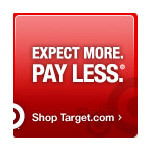 Don't forget to mention ChossonKallah.com when visiting Target. Target's Daily Deal where you can often find a great bargain.